Are you sick of using harsh chemical cleaners to get the dirt and grime off your concrete floors and driveway? Have you been searching for different cleaning solutions that don’t involve you using a pressure washer or power washer to clean your concrete patio? Or ones that don’t require using ingredients like oxygen bleach to get rid of concrete stains? After asking yourself all these questions, it’s our turn to ask you one question: Have you ever tried making a homemade concrete cleaner? Mixing ingredients to make an efficient DIY concrete cleaner may seem harder than you think, but it’s not. We’ll teach you the basics of making the best homemade concrete cleaner using ingredients like baking soda, hydrogen peroxide, laundry detergent, white vinegar, and warm water. The best part is that you’ll be able to get out those tough stains while putting minimal elbow grease into it! When it comes time to cleaning oil stains off concrete, it’s important to know that you’ll have to use a DIY concrete cleaner that digs deep down into the pavement. If you’re looking for an excellent way to get oil stains off concrete, start mixing ingredients to make an excellent homemade concrete cleaner. Apply baking soda directly to stain and let it sit for a few minutes. Pour vinegar on the baking soda and the mixture will start to fizzle. Then, apply laundry detergent and scrub with a stiff brush. Rinse the area with a fully powered hose. Repeat if necessary. The floors of your house are precious to you, and that’s why you keep them clean; well, the same should go for your patio. We suggest cleaning your patio in the spring, before peak patio season. Before applying a DIY concrete patio cleaner, be sure to remove all “extra’s” from the concrete (e.g., plants, chairs, etc.). Then, sweep away any dirt or debris present on the patio and apply homemade concrete patio cleaner. Mix bleach with water and then add dishwashing detergent to the mix and put it into a spray bottle. Spray the solution onto the cement patio, let it sit for a few minutes, then scrub the mix into the concrete with a stiff brush. A homemade concrete cleaner that provides a gentle cleaning solution is typically eco-friendly; eco-friendly homemade cleaners almost always use ingredients found in your kitchen. Mix equal parts water and vinegar and apply to concrete. If this stain removal technique doesn’t work, use 100% vinegar and scrub stains out. This solution can work on many surfaces, including car seats and hardwood floors. First things first, use a pressure washing or a power washing technique to get rid of loose dirt on the cement. Once you’ve done this, use a dry cleaning method, or let the cement air dry before moving on to the next step. Once the surface is dry, pour or spray lemon juice on the rusted areas. Let the highly acidic liquid sit for ten or more minutes before scrubbing. You can use white vinegar to get the job done, too. Then, rinse off the surface with cold water. If you’re having trouble getting rust stains out of concrete on more delicate or worn out areas, try using a sponge with a rough surface and avoid using a wire brush. The best defense mechanism against a dirty countertop is to seal it completely. Think of it this way: unsealed countertops encourage stains, and sealed countertops shoo them away. If you purchased a countertop, chances are the company you hired to install the countertop used a concrete sealer to keep the counter stable. However, over time, seals can fade. In turn, this means that the countertop in your home should be re-coated every few years to prevent stains from showing up. One way to make sure it’s time to re-seal your countertop is to check whether water still beads when present on the surface. If it doesn’t bead, you’ll want to start looking into sealing quartz countertops. Power washers are by far the most accessible tool to use when trying to clean the exterior of your home, especially when it comes to concrete. If made right, a homemade concrete cleaning solution for pressure washer can kill off mold, too. To start making your solution, pour one gallon of water into a bucket. Try to get the water to a hot temperature. Then, add baking soda little by little and stir while adding the baking soda until it has dissolved into the water. Add in one quart of household bleach and dish detergent, then mix slowly to avoid the suds from overpowering the bucket. Once this natural cleaner is mixed together, pour it into the pressure washer and follow the directions for the tool as stated on the packaging for the best DIY cleaning result. There’s always one cleaning solution out there that takes seconds to whip up. Recipes like this will give homeowners a break, especially when it’s been a rough week. Mix the two ingredients until the solution is thick and soapy. Pour little amounts of the solution onto stained areas, or dip a wire brush in the solution and start scrubbing the stained surfaces. Learning ways to clean concrete around the inside and outside of your home is the start to a great home improvement lifestyle. Here, you’ve determined how to make the best DIY miracle concrete patio cleaner. 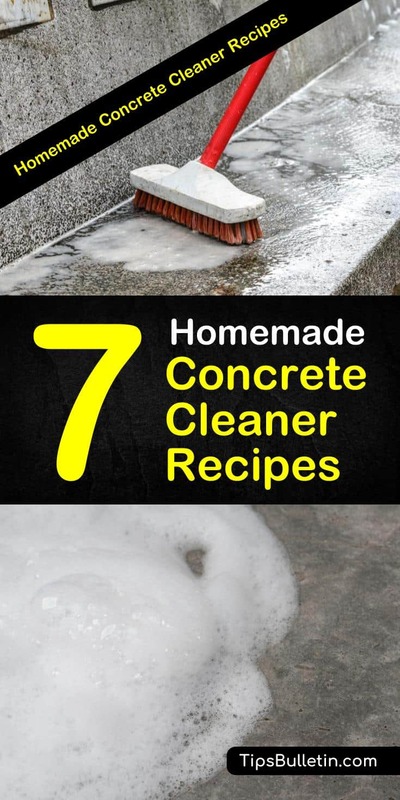 You’ve also learned how to mix kitchen ingredients to create long-lasting homemade concrete cleaning recipes. 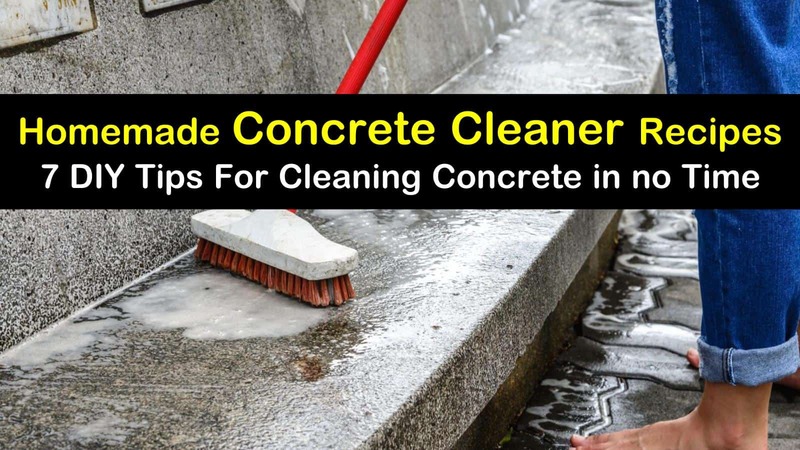 We hope you like our homemade concrete cleaning tips and recipes. Please share these DIY concrete cleaner ideas on Facebook or Pinterest with your friends and family.